Once upon a time there were two amazing Cookiers, Sugarbelle (Callye) and Lilaloa (Georganne). They were loved and admired by many, from far and wide, for their crazy decorating skills and kindness, and in time were considered cookie royalty. Three Cookie Stars, Hani (Haniela's), Michelle (Make Me Cake Me) and Mike (Semi Sweet) organized this fun, virtual cookie get-together and have appropriately themed it, "Your Royal Highness". Thanks so much for inviting me to participate! I especially love the royal icing transfers, and need to thank Lisa (The Bearfoot Baker) for all the royal icing transfer inspiration! Callye and Georganne, Congratulations on the birth of your beautiful baby girls! I hope you enjoy all the cookie sweetness and love being sent your way today! 1. Mix cookie dough according to recipe. 2. Roll out dough about 3/8-inch thick. 3. Cut out dough with star cutter and place on baking sheet. 4. With a small, sharp knife, make a small slit in the bottom of the star, and gently insert a lollipop stick to the center of the star. 6. Let cookies cool completely. 7. Tint the royal icing with the rose food coloring. 8. Outline and fill the stars with the royal icing. 9. 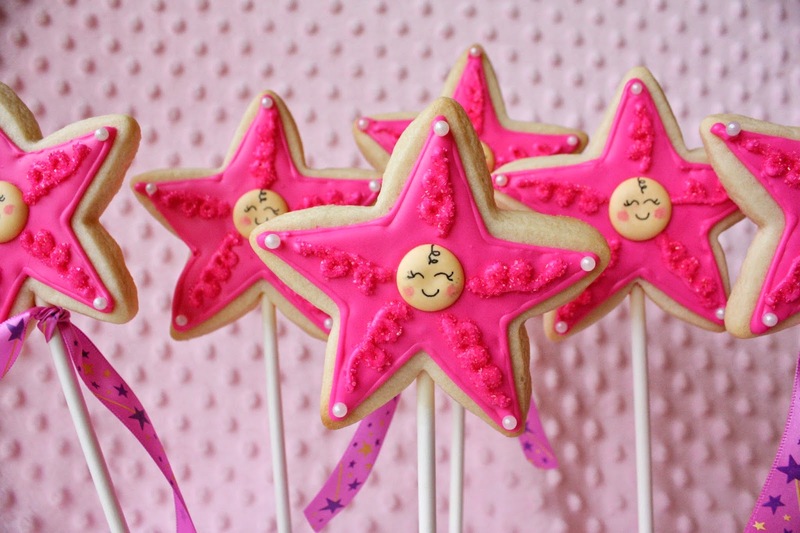 Add a sugar pearl to each star tip. 10. Drop the (royal icing transfer) baby face onto the center of each star. 12. Using the royal icing, pipe on some swirls on each star section, and then liberally cover with the pink sugar. 13. Leave it to dry for an hour or so, and then dump off the excess sugar. Tint some royal icing to the skin color of your preference. When they are completely dry, at least 24 hours, gently peel from the wax paper. Using the black food marker, apply a face and a hair curl. With the pink marker, add the cheeks. 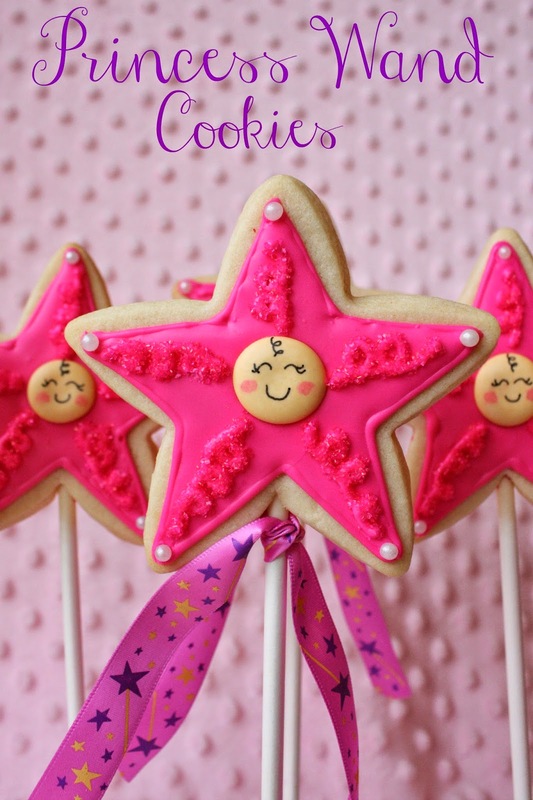 Be sure and check out all the adorable and creative cookies linked below! Adorable cookies the ribbon you found is perfection and your photos are stunning, great work. I am loving this hot pink!!! And their little faces are so cute! 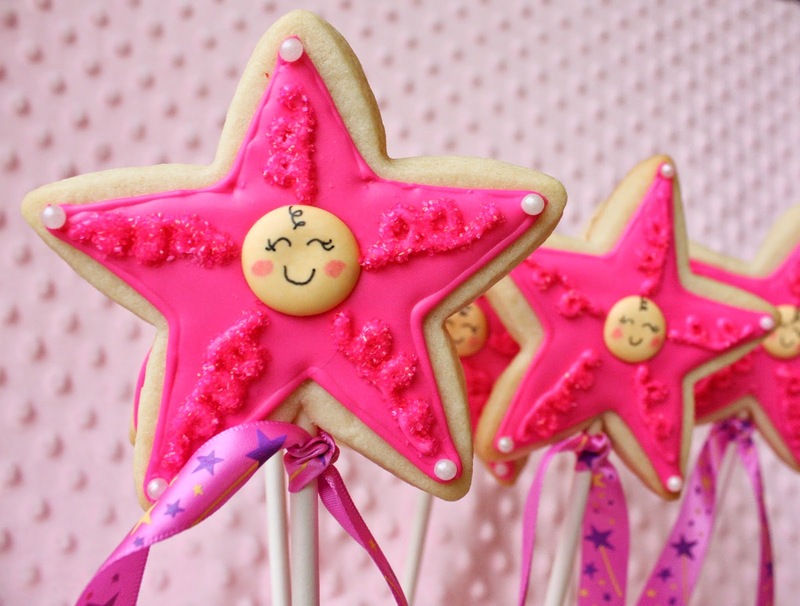 Every princess needs a wand and a cute little wand that you can eat makes it DELICIOUS! Every Princess needs a magic wand. I love these, using a RI transfer sure makes these easy! OH my gosh, seriously adorable! Oh my goodness! Those CUTE LITTLE FACES!!! I could just squish them!!! Princess wands are a genius idea! I need to make some for all these little girls at my house! And yours are pink and sparkly! They could not be more perfect!! Every girl deserves a princess wand! Adorable! And what is this Wilton Rose color? It makes a fabulous shade of super pink! Sue, this is such a cute idea to combine princess wand with the baby. Love their cute little faces. I loved your story and your cookies Sue! Such clever idea! Every princess needs a wand! :D Lovely faces! 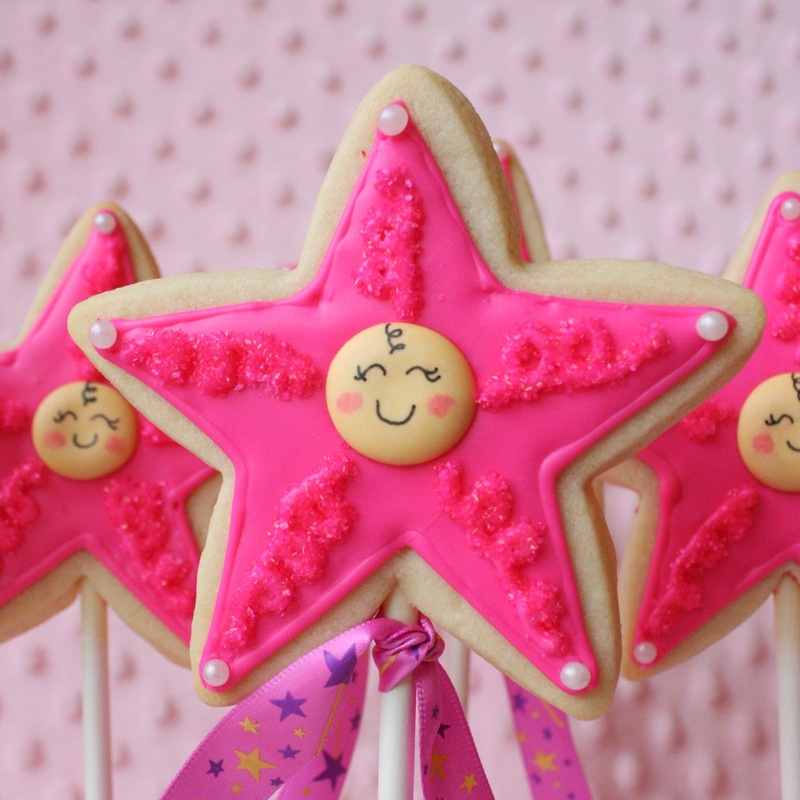 Your wand cookies are so pretty and the little faces are just too sweet. Your Royal cookies are amazing! I can't believe they both had their babies on the same day! Georgann was so pregnant at Cookie Con but still did an amazing job! She was adorable. All of Virtual Baby Shower cookies are fantastic. Absolutely one of the most adorable cookies ever!! Where have I been this past week and how did I miss all your cute cookie posts?! These are adorable. LOVE the little faces in the middle, Sue. My favorite new cookie!! LOVE!